How can Artificial Intelligence be Harnessed to Achieve Fair Value on a Derivatives Exchange? ‘Fair Value’ is the sale price that is agreed upon by a willing buyer and an equally keen seller in an agreement. Sometimes the market determines fair value of an investment, other times; fair value represents a company’s assets and liabilities when a subsidiary company’s financial statements are consolidated by its parent company. Donatas Vadopalas, Quantitative Analyst from Level01 isn’t really into either. Instead, he and his team chose to perfect true fair value on their cutting edge platform Level01, the World’s First Peer-to-Peer Exchange for Derivative Contracts. “In the derivatives markets no-arbitrage principles often dictate where the fair value or, in other words, pricing should be. Market fragmentation between retail investors and institutional investors often puts retail investors at odds against their brokers as their ability to trade at (or close to) no-arbitrage prices is limited.” explains Vadopalas. So, how do you solve this discrepancy? Good question. When global Derivatives Exchanges are littered with news reports of fraud by brokerages, investors can be forgiven for sporting an even bigger frown and sweatier palms. Of course, the solution is more intelligent than you think because on Level01, you are not going to be trading derivatives via a broker; you’ll be trading directly from peer to peer on a platform that enables ‘Fair Value’ to occur. How so? Level01’s system architects and engineers have achieved ‘Fair Value’ by harnessing artificial intelligence onto the platform. Artificial Intelligence may feel experimental but it’s the child of our time — it speaks to us about our evolution and our changing world. iPhone users have grown accustomed to Siri and Tesla’s cars are driving without drivers. We are accustomed to having technology help us in our daily lives. Artificial Intelligence could rapidly change Asia — and the world at large. According to a UBS CIO report, by 2030 it will have added up to $3 trillion of economic value to Asia annually. And the team at Level01 recognizes artificial intelligence’s power to unlock an even larger economic value that could reach the quadrillion-dollar mark by bringing honest, truthful simplicity into the complex and swindle-ridden world of derivatives trading. Aptly named FairSense, Level01’s revolutionary artificial intelligence works to overcome discrepancies by providing valuation analytics using standard and widely accepted approaches to modeling a derivative instrument, prices of other similar traded instruments in financial markets, data feeds from reliable inter-bank dealers, electronic exchanges and retail brokers and market quotes with quantitative modeling. “We used the Black-Scholes model as an example, it is a standard market convention for pricing and quoting of vanilla derivatives” says Vadopalas. “In that model, the key inputs to the pricing models are the current price of the underlying asset (e.g. spot EUR/USD price), volatility of the underlying asset and relative funding rates (or underlying forward prices). Then, we incorporated this along with Real Time Volatility Modeling to build Level01’s Quantitative Modeling as part of the FairSense artificial intelligence” he explains. “FairSense will observe and sequence real-time, cross-market variables, in the most liquid financial markets. These will be used to provide market consistent pricing analytics to users on Level01’s Derivatives Exchange. 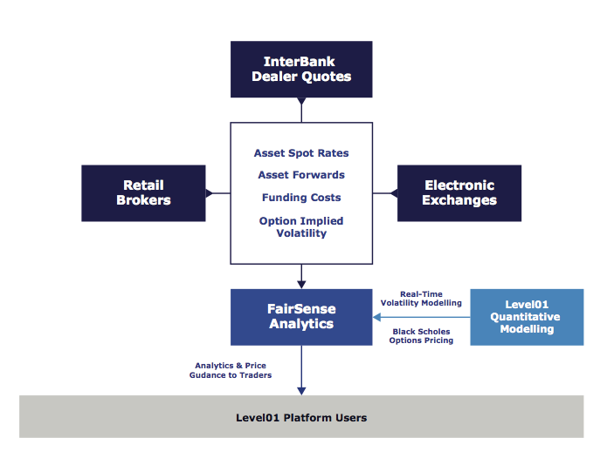 This, in turn, will allow retail investors to continuously submit offer prices for the instruments they would like to trade consistently with other instruments traded globally, providing improved liquidity and price discovery on a peer-to-peer exchange” explained Vadopalas as he runs his finger on the screen to illustrate the diagram. A flurry of keyboard clicks fills the office. Vadopalas turns to us to explain that the Level01 team is methodical in the quest to develop FairSense’s artificial intelligence so that it can benefit investors: How can the data be more accurate and relevant? Are the model construction, methodology, application and critical path analysis up to par to serve investment decision-makers? “We wanted to be sure. There’s no way I am allowing investors to touch anything that doesn’t meet our standards” says Vadopalas. The Level01 team aims for artificial intelligence that is intelligent and relevant even in 50’ years time and FairSense is ensconced in all the winning elements: a tech ideal coming true, solid research and testing, transparency, speed, accuracy on a level that’s never been achieved before and a team that continually seeks improvement. “We’d always take the long view. With patience, we can prove and establish a model and platform that will inspire other investment platforms to emulate” says Vadopalas. Human beings emotionally and when they come to trading they are facing difficulty to control it which let it has a big impact on their trading. It can turn a successful trading to a losing one but artificial intelligence don't has any emotions and additional to that they have a big experience in specifying when enter or exit any trading. 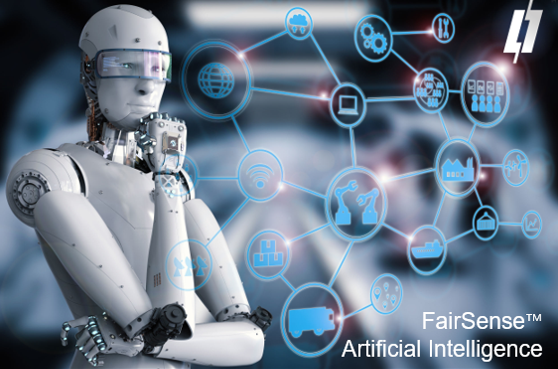 By introducing their FairSense’s artificial intelligence Level01 is helping their investors to gain more profits from the market and avoid the losses.